Découverte exceptionnelle avec une équipe très sympathique ! On voit vraiment l'île autrement et c'est totalement adapté au débutant. 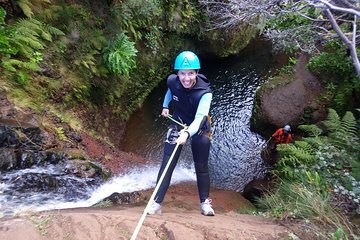 Les guides expliquent très bien les consignes de sécurité et sont vraiment attentifs, ils donnes des explications complémentaires sur le canyoning mais aussi la nature de Madère. Les équipements sont vraiment adaptés et vous permettent de plongé dans de l'eau à 7 degré sans ressentir le moindre froid. L'équipe de guides se charge de prendre les photos et de les envoyer. Ils en font beaucoup et elles sont de très bonnes qualités. This activity was so much better than I expected! It was the right amount of adrenaline and fun! The scenery was epic and by the end of it I was at one with nature. Special shout out to our guides Pedro and Philip aka Sherpa and Shrek for just being awesome. They picked us up the hotel, we arrived at the park where we were asked to change to the appropriate gear which they provide. I had a small moment of panic there, as I couldn't get the bodysuit all the way up! But the guides ran to my rescue, brought me a bigger size and helped me slide it up! It's an uncomfortable attire but you get the hang of it soon enough and it's all good! The adventure began, the guys were very professional: guiding us through everything, watching over us and having fun with us as well. You can't imagine how beautiful the canyons were, we saw some amazing stuff, it was so quite around, secluded, birds were chirping, it was magical. The guides provided us with chocolate and water midway which was very nice of them. They were also taking pictures of us the whole three hours which was pretty awesome You can't carry stuff with you during. It was one of the best days ever, I definitely recommend this. It's important you wear a swimsuit and bring a towel as instructed! Don't forget! Really fun adventure!!! Our guides Phillip and Phillip were awesome. Suits were a challenge to get into but worth the effort. Really fun outing for the adventurous travelers in good shape!!! One of the best experiences me and Mrs W have ever had. From start to finish we were made to feel welcome and most importantly save at all times. With clear instructions both of us knew just what to do, it was our first time. One of the major benefits has to be you access some of the most spectacular scenery that otherwise you wouldn't be aware of. Mrs W felt at the end she had achieved the impossible and felt completely and rightly pleased. In summary if thinking about canyoning just grab the moment and do it. You couldn't wish to use a better company than Harmony in Nature. Absolutely amazing great guides,felt really safe. Definitely try this.